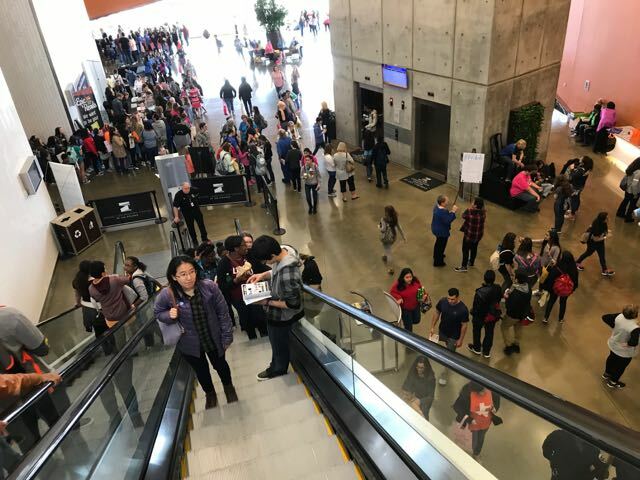 As a landing party of one, I descended upon the North Texas Teen Book Festival on Saturday. I was told that it was a potentially habitable place for intelligent life forms, but I had no idea. Spotted in 1st 5 minutes at #NTTBF17: "Book Nerd" bags, Star Wars Tees, Thor packs, a rainbow of headgear and smiles. I'm among my people. Luckily, the inhabitants of the planet were also quite friendly. And fashion-conscious. I wore my Phantom Tollbooth shirt to #NTTBF17 and have now set a record for people telling me "Nice shirt." Again, I am among my people. I started off my day with a session on Star Wars books, with two actual Star Wars authors: Ben Acker and Adam Gidwitz. How major are these guys? They have written books that are actually officially part of the Star Wars canon. Which means, as I understand it: There is like this nerd college of cardinals at Skywalker Ranch whose job it is to approve everything in every official Star Wars product, and these guys passed. Although there were some weird rituals that I do not quite understand. Anyhow, after that, I saw a couple of great panels. Here's me at the end of one. I also splurged on some swaggy swag. And best of all, I saw a whole bunch of people enjoying books. Report summary: What a great event. I look forward to conducting future explorations in the future.